This is a large dumpy black fly that may look unremarkable but, when seen closely, shows intricately spotted eyes. It is one of the few truly coastal hoverfly species in Ireland and is rarely found more than a few metres away from the shore. 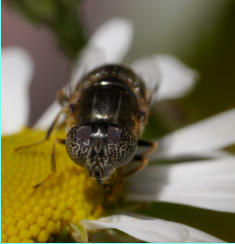 It is one of the first hoverfly species to appear in spring and has a long flight season extending into September. The saprophagous larvae live in pools with accumulations of rotting seaweed. The adults are often seen sitting on rocks on the strandline, as well as visiting flowers such as Common Ragwort (Senecio jacobaea), Sea Mayweed (Tripleurospermum maritimum) and Wild Carrot (Daucus carota). While hoverflies do not have official common names, I think that the rockpool hoverfly is an apt descriptor for this species. However, as with many species, E. aeneus has a wider habitat range in continental Europe where it occurs inland along large rivers and in association with animal dung and sewage farms. 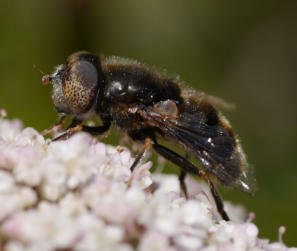 There is one other species of Eristalinus in Ireland (E. sepulchralis), and both display a combination of a looped wing vein and spotted eyes. 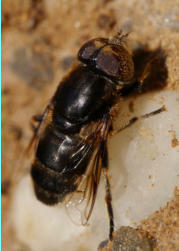 E. aeneus can be distinguished from E. sepulchralis by the absence of hairs on the lower part of the eyes and the glossy black or bronze abdomen; E. sepulchralis’ abdomen has a wrinkled appearance with dull patches on the upper surface. E. sepulchralis is a wetland species and generally does not overlap with E. aeneus although both species may occur together on the seaward edges of coastal wetlands. E. aeneus has been recorded widely around the Irish coastline (map) and most of the gaps in the distribution map probably represent lack of recording effort rather than true absences. 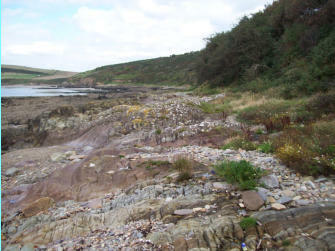 It is common along the coastline of East Cork, both on rocky shores (such as Roches Point) and sandy beaches (such as Ballybranagan Strand). However, it may be absent from the more estuarine areas in the inner part of Cork Harbour and around Ballycotton Bay and Ballymacoda Bay and I have not recorded it from Pilmore Strand.